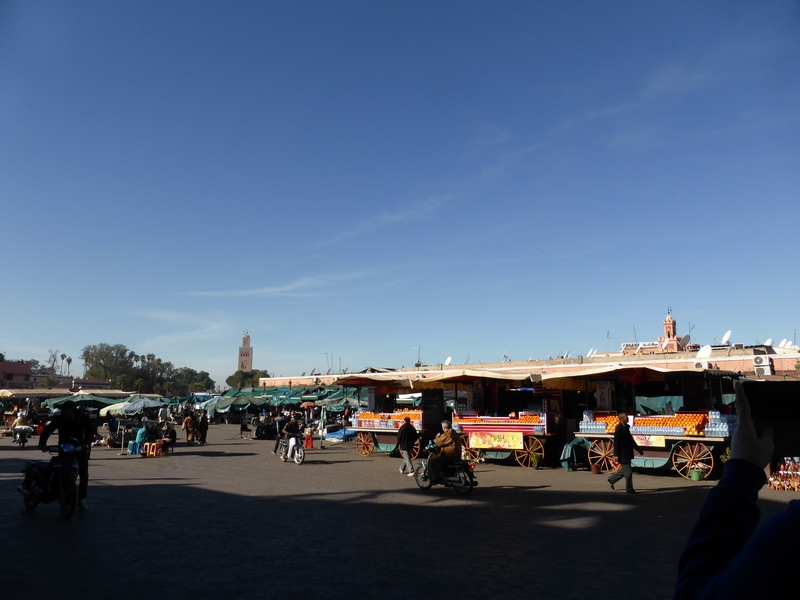 The thing that will always stick in my mind from Marrakech is Djemaa el Fna. I’m loathe to call it a square as that is definitely not its geometric form but it was a bustling place with shops and food stands, snake charmers and monkeys. In the evening there is a cacophony of noise as people gather to socialize, to dine and to listen to the storytellers. More importantly for me it was the place I used to keep my bearings as I navigated my way round the medina. It’s not easy you know. 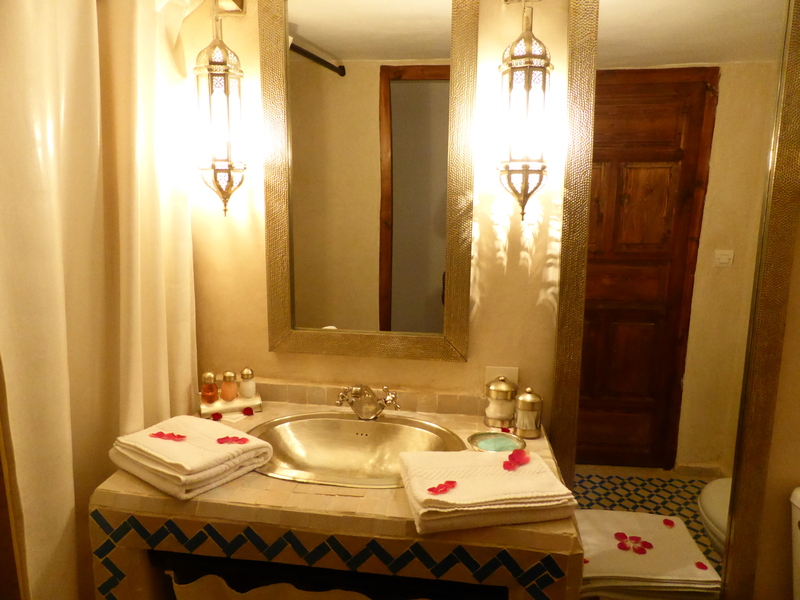 With navigating the city in mind, I chose to stay in a riad located close by. It was unsurprisingly (for the medina) located at the end of a winding alley which seemed never ending at first but you turn a bend and there it is. The Riad Magi welcomed us warmly with mint tea and gave us a cool, tranquil retreat after a hot (and often chaotic) day’s sightseeing. And it seemed that they were even more pleased to see us when we returned for a second stay. The rose petals were a lovely touch. 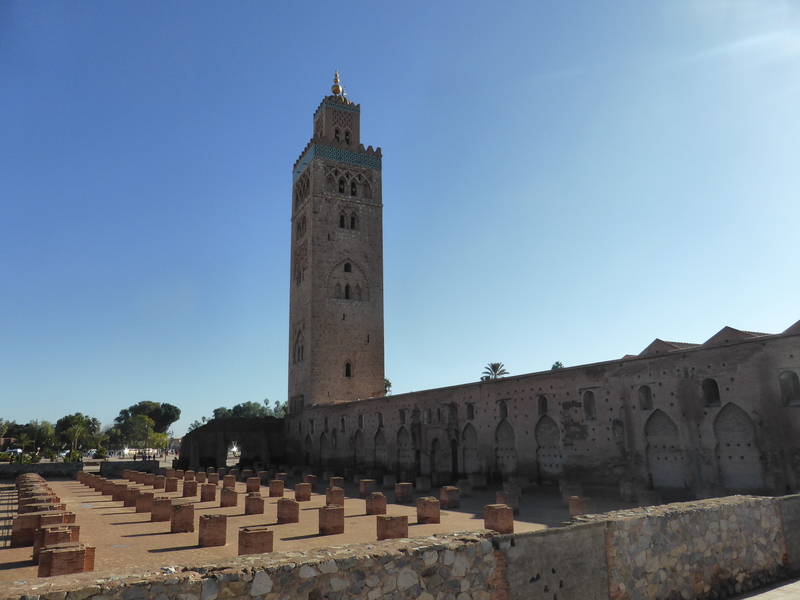 One of the major landmarks in Marrakech was the Koutoubia Mosque. The Almohad tower is stunning and proved another useful landmark to navigate by. Behind the mosque you find the Koutoubia Gardens (pictured at the top of this post). 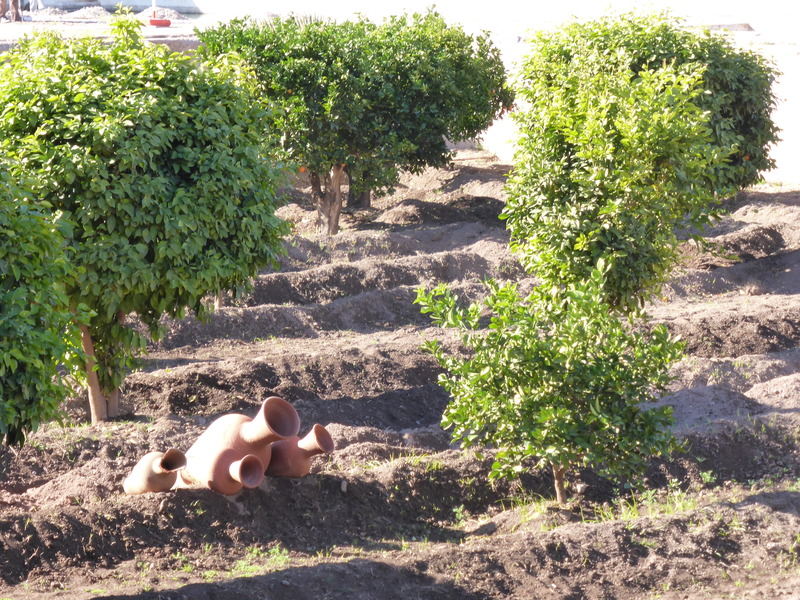 Wherever I travel, I love to visit gardens and when you are in a desert country like Morocco it is especially pleasing to find greenery and shade. 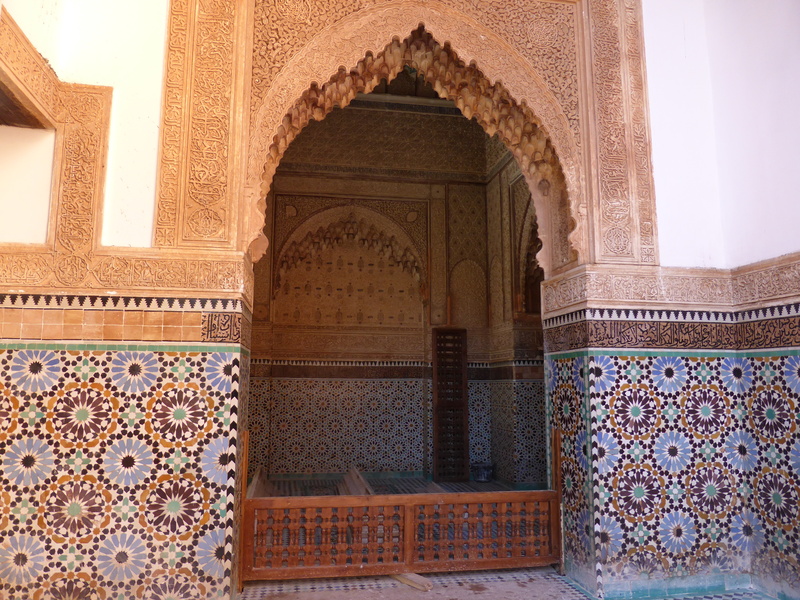 Heading south from the Koutoubia Mosque, you reach the kasbah where you can visit the Saadian Tombs. For a 10dh entry fee (approx. 1 euro), you can explore this beautiful site with intricate stonework and colorful tiling. 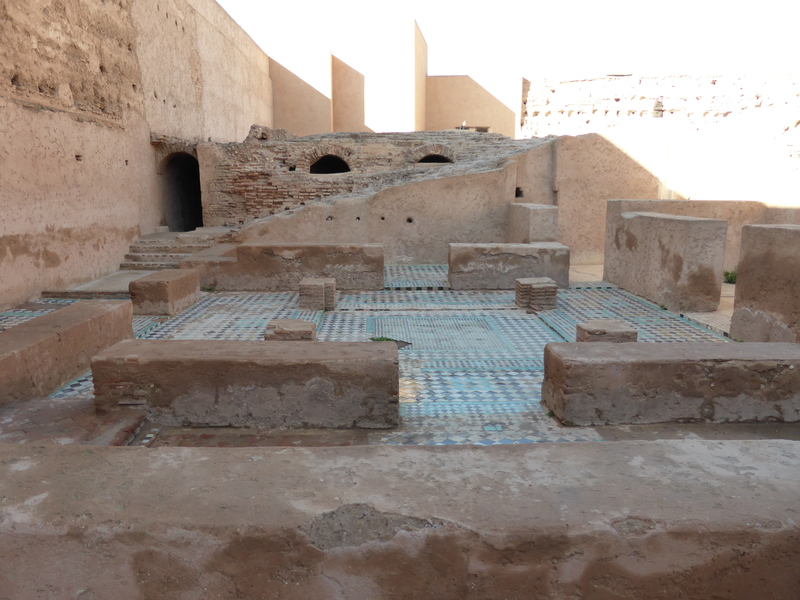 Close to the Saadian tombs is the El Badi Palace, ruined now but still beautiful. The entrance to the palace is located immediately to the right when you enter through the gate from Place des Ferblantiers. We missed this the first time and went for a nice walk in the opposite direction. Not a bad thing because getting lost is often when you find the most beautiful things when traveling but we were amused when we retraced our steps and this time the path to the entrance was directly in front of us and easy to spot. Entry is 10dh and for a further 10 dh you can also see the 12th-century Koutoubia minbar (a pulpit, not a misspelt selection of overpriced refreshments). The central courtyard alternated pools and sunken gardens and round the edges you can find the ruins of the stables and other parts of the palace. 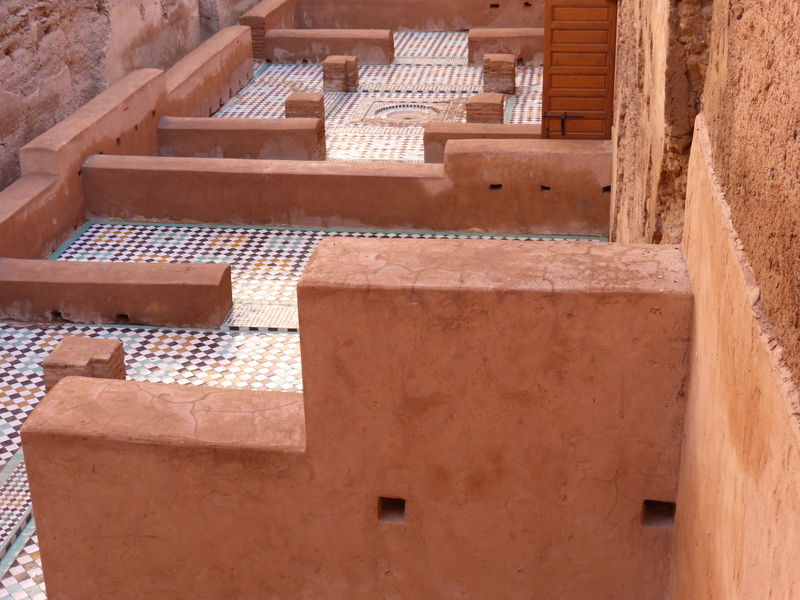 All with the beautiful tiling which seems to be found everywhere in Morocco. 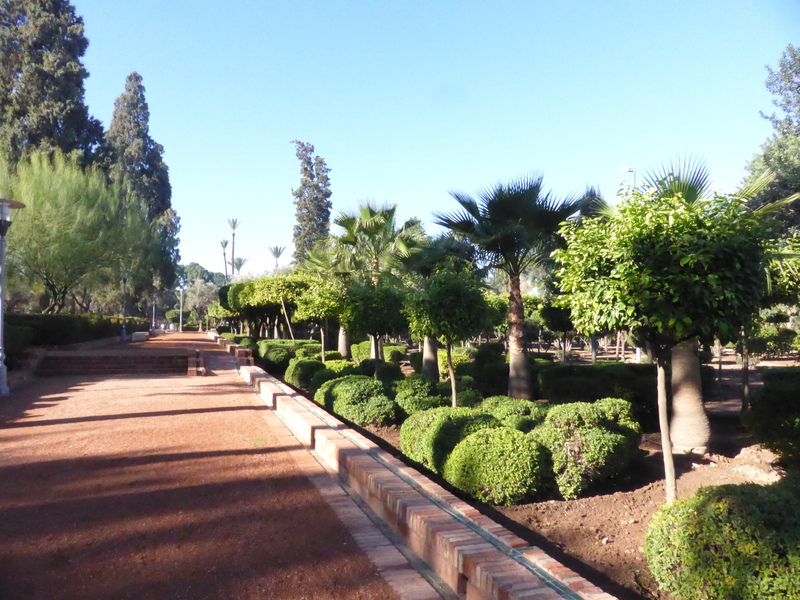 The sunken gardens contained citrus trees which seem to be the favored trees in Morocco. 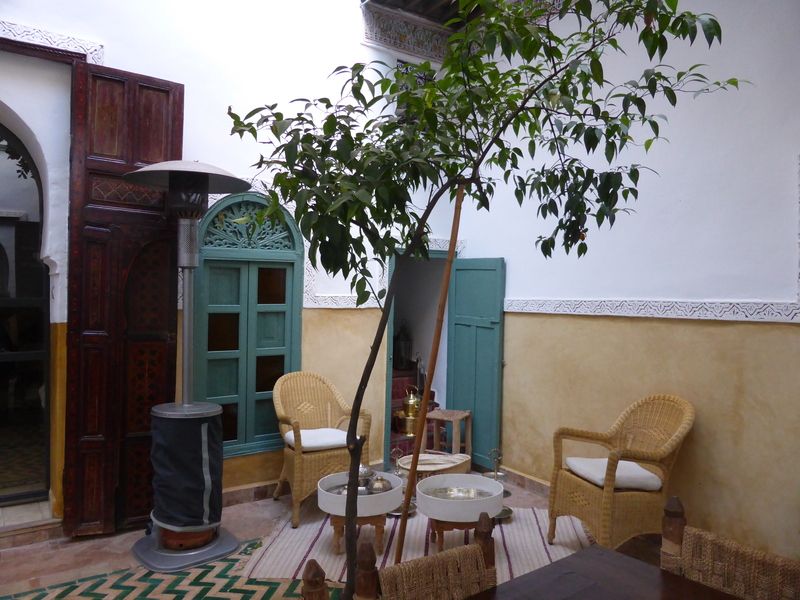 We had citrus trees in our riad as well and I had a close encounter one morning at breakfast. Thankfully the orange in question missed my head otherwise I suspect I may have ended up with a slight headache. Near the entry of the palace are the ruins of rooms used by visiting diplomats. Even in the heat of the day, the high walls keep this space beautifully cool. And, look, more beautiful tiling. Outside of the medina and kasbah, on the way to the Ville Nouvelle, you can find the CyberPark which offers free wifi at outdoor kiosks or the option of paid access in the air-conditioned cybercafé. 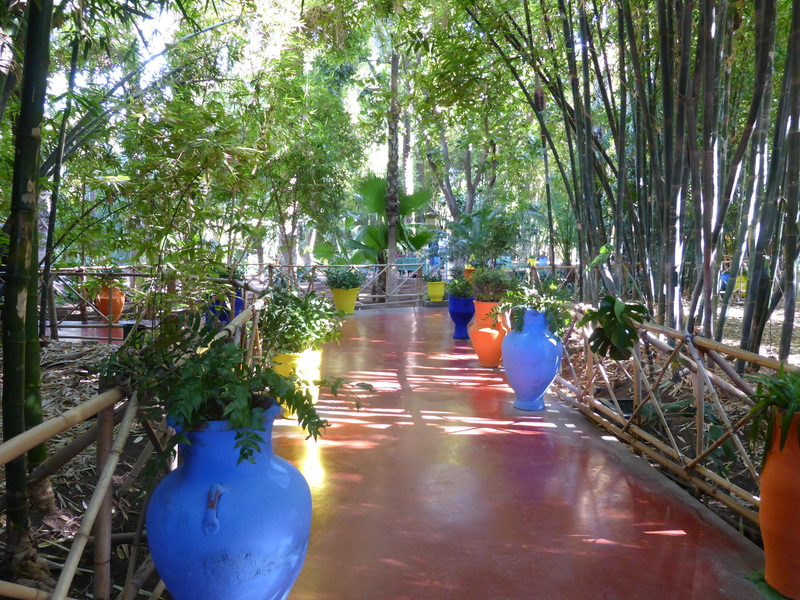 I’ve already enthused about the Jardin Majorelle but it was one of my favorite parts of Marrakech. Located in the north of the city it is a bit of a walk from the central medina but then again walking is always my favorite way to explore a city. 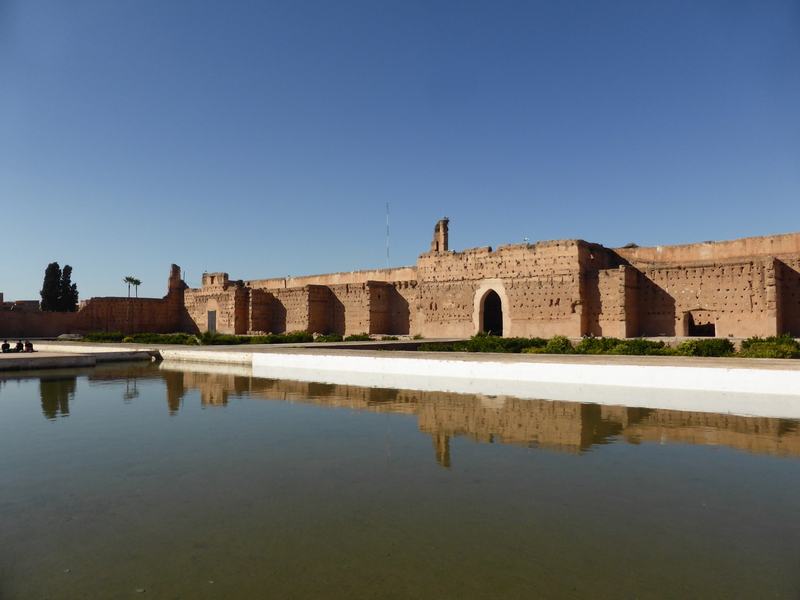 Another favorite place was the Bahia Palace. 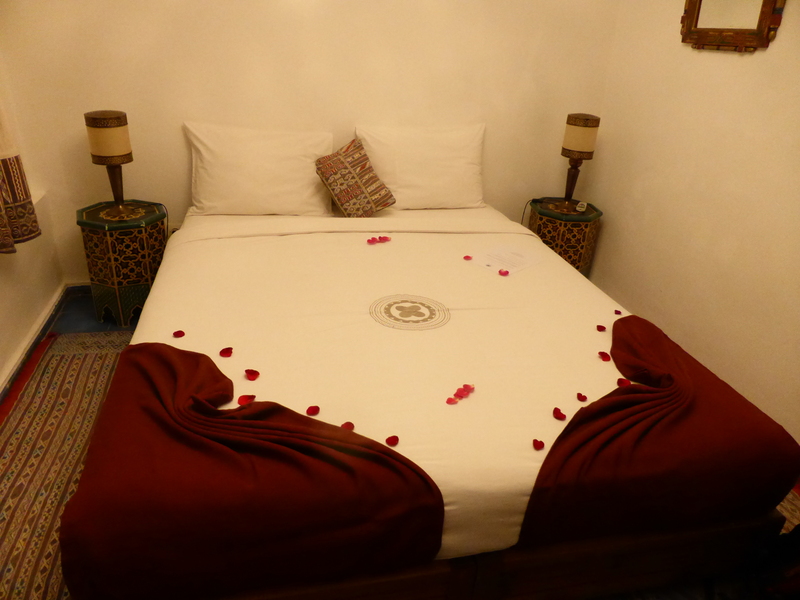 Located close to the El Badi Palace, another 10dh entry fee gave access to a very different palace. 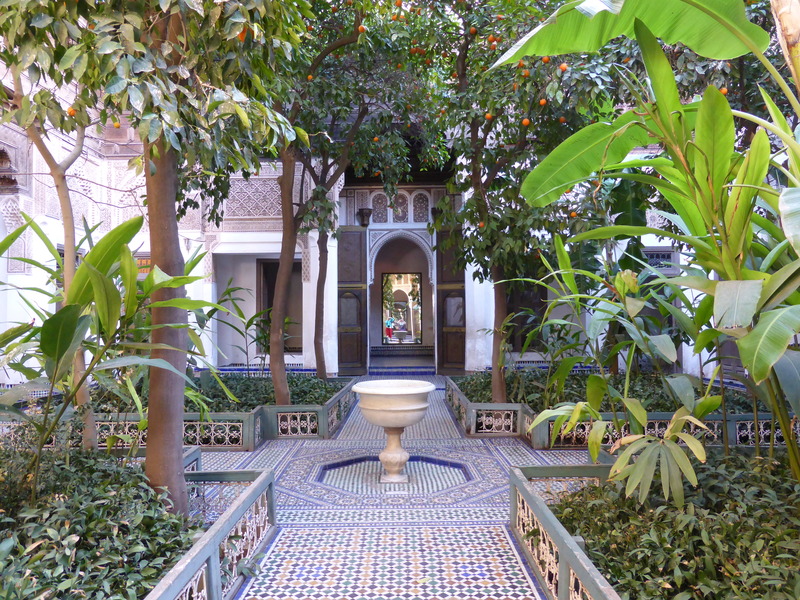 Ornate décor, painted ceilings and stained glass give this palace a luxurious feel but, as always, it was the outside space which thrilled me, such as the small riad (courtyard) below. I didn’t get a henna tattoo. I didn’t ride on a camel – this is apparently possible in the Menara Gardens but I didn’t visit those either. I didn’t visit a hammam. 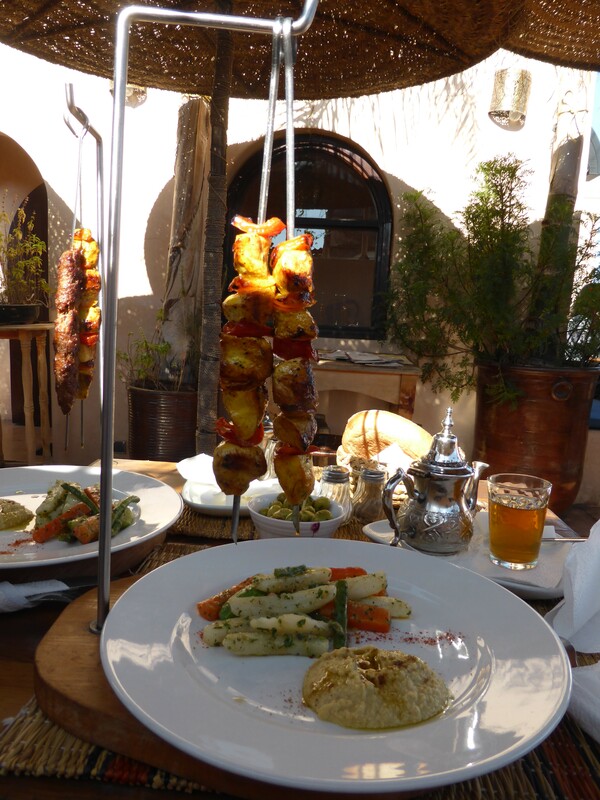 But I did drink (lots) of mint tea, see lots of beautiful things and fall in love with Moroccan food. 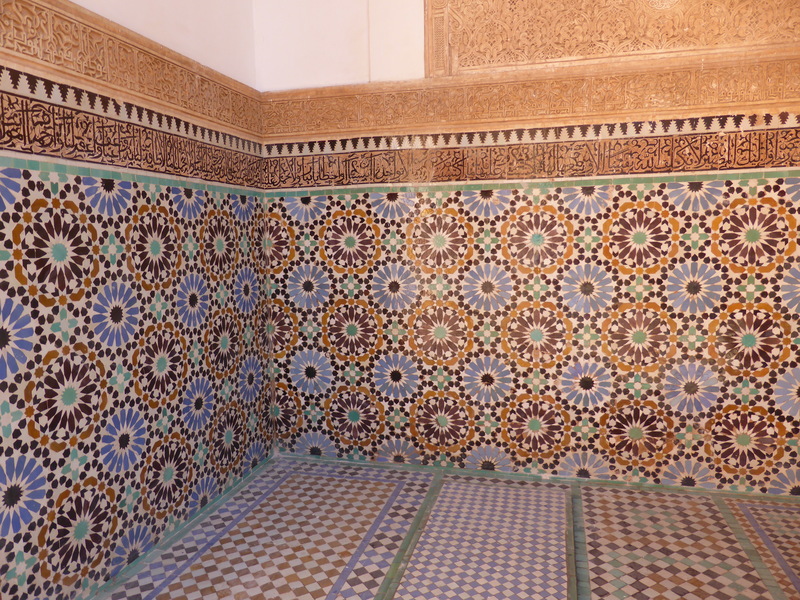 So much tantalizing beauty and interest – spectacularly combined in the Islamic art of architecture and tilings. I am sorry spellcheck does not recognise the final word which promises good maths!